The opening hole is your best chance for a birdie. It's wide open with sand traps on either side of the green. A par 5 for the middle and back tees and a par 4 for the front tee, be careful as the green for this hole is two-tiered and preceded by a valley. Long hitters can reach the green to make par on this hole, but only if they avoid the sand traps to the back and right of the green. A sand trap at the back of the green makes this a short, but tricky, par 4. The green slopes to the right so your ball can roll right off the green. It can also get stuck in the sand trap. On our most challenging hole, this long par 5 can make or break your game. If you don't get off the tee correctly on our shortest par 3, your ball can roll off the front of this sloped green and give you trouble. A sand trap to the left-front of the green causes problems if it's not played just right. Watch out for a sand trap to the left of the green on this short par 3. Your best chance for a birdie or even an eagle is the closing hole of the front nine. Strong hitters can get a roll off the tee onto this downhill green. There is a beautiful water fountain and pond to the left of the green, making it one of the more scenic holes. The middle tees hit over a creek that is difficult to avoid. The back tees are 42 yards behind the middle tees and elevated. A straight shot from the tee, this par 4 is challenging with a fairway that goes uphill before it levels out. This par 5 makes you work for par with a fairway elevated from the tee box. This mid-length par 4 has a downhill, dogleg-left fairway. This downhill par 3 is guarded by sand traps in front of and to the left of the green. Our second-longest par 4 goes downhill on the fairway then back up on the green. This tricky hole is a par 4 for the middle and back tees and a par 5 for the forward tee. A creek at the end of the fairway forces you to hold your swing back, or your ball might end up in the water. A sand trap to the right of this elevated green causes all sorts of problems if it’s not well-played on your first club. With a pond and a water fountain to the right of the green, and the clubhouse in the background, this scenic dogleg-right par 4 is a beautiful spot to end the back nine. 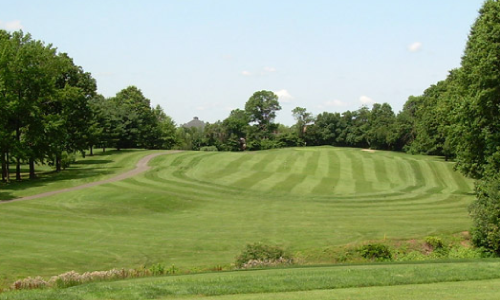 South Shore Golf Course, located on Staten Island just 20 minutes from New York City, is a 6,370-yard, par 72 course with three distinct sets of tees, making the course challenging for golfers of all skill levels. The generous fairways often call for length off the tee, while the small greens demand a precise short game. 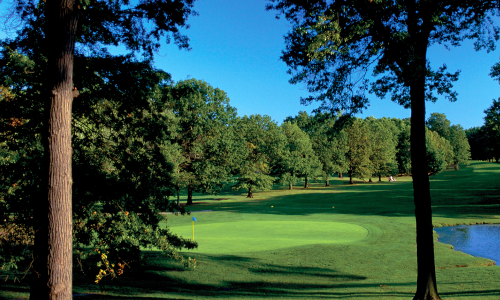 With a number of recent renovations, the course is considered one of the “Best Places to Play” in Staten Island. (718) 984-0101 or click here.